Spa guests need the flexibility to book an appointment from anywhere, at anytime. With a seamless booking solution, guests are able to choose the treatment they want, when they want at the click of a button. 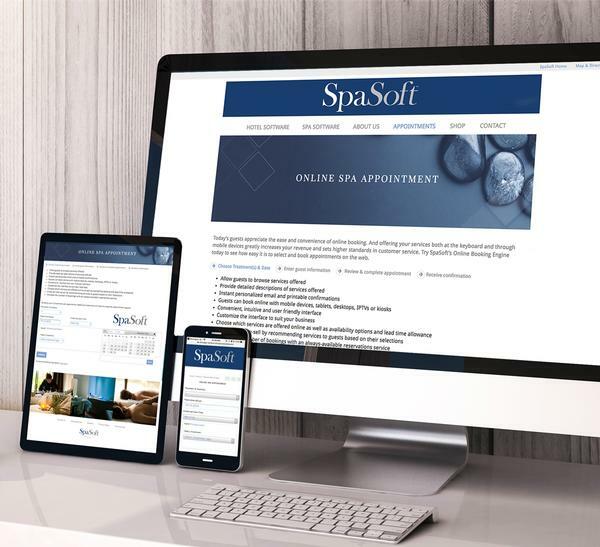 SpaSoft’s Online Booking Engine empowers your guest to get the most of what your spa offers. Spas that keep their booking solution simple are able to capture more revenue and allow guests to view what they want when they want. SpaSoft’s Online Booking Engine streamlines the booking process from landing on the site all the way to securely paying for the treatment. Guests have a tendency to trust what is most familiar and are more likely to book online when they recognise the brand. SpaSoft’s ability to customise and tailor your booking engine to match your brand standards allows your guest to be comfortable when booking, while you are able to yield and control the services you want to sell online. Efficient synchronisation between the guest online booking experience and your spa management system allows your spa to maximise revenue and boost appointment bookings. Spa bookings are always in flux, however with SpaSoft’s real time, tight integration between the two systems, spas are able increase bookings throughout the day. Guests today expect to be able to book online, whether they’re sitting at their desk or sitting by the pool. They want the instant gratification of being able to reserve online when the inspiration hits them and mobile online booking makes that possible. Online spa booking will be your 24/7/365 reservationist, always available for bookings. You have full control over all of the online offerings while providing a seamless booking experience for the guest. Now is the time to make your spa run more efficiently, connect more easily with your guest and in general, just make your life easier. SpaSoft provides a complete online booking engine to book anywhere, anytime increasing your overall revenue.